Come out to Republic Harley-Davidson located at 12707 Southwest Freeway in Stafford and witness a Winter Wonderland in the midst of summer! There will be specials on new Harley-Davidson's plus Houston's best selection of quality pre-owned Harley-Davidson motorcycles with prices that only Santa can do. Bring your camera and your Christmas list. The Motorclothes Department has something for everyone...whether you own a motorcycle or not. The staff is in Holiday cheer and their will be treats for all to enjoy! 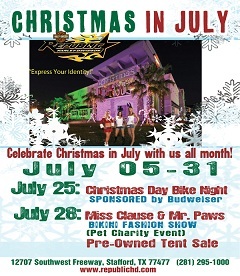 There will be several events for you to experience the festive season at Repulic Harley-Davidson, such as "Christmas Day" Bike Night July 25th - Santa will be there! Plus, "Miss Clause and Mr Paws" bikini fashion show July 28th supporting animals in need of adoption and care. Dogs will be in the fashion show too! You will be amazed at the decorations!!! Who ever said Christmas only comes once a year hasn't been to Republic Harley-Davidson! See you there!